The Seoul Museum of Art on Tuesday kicked off an exhibition that traces its 30-year history, not just by highlighting the museum’s collection but also by reinventing its artworks. Titled “Digital Promenade,” the museum’s 30th-anniversary exhibition features 30 artworks produced between 1961 and 2017 by renowned artists here, as well as 10 commissioned tech-art productions of young local artists. For the latest exhibition, the SeMA has brought together old art pieces and contemporary artworks based on high-end technologies. Instead of separating works from the past and today in different gallery spaces, the museum displays them in the same exhibition spaces to create an interesting juxtaposition. As suggested by the keywords and the title “Digital Promenade,” the exhibition sets out to offer a unique walking experience. Of the 10 commissioned works, Kwon Ha-youn’s interactive video installation “When You Get There” fits the underlying theme of the exhibition particularly well. Besides taking motifs from Suk’s painting, Kwon’s work also makes connections to An Kyon’s 1447 traditional landscape painting depicting Grand Prince Anpyeong’s dream, which Suk’s “New Scenery in Dream” is based on. Kwon’s “When You Get There” also makes anew traditional paint work by reconstructing it via contemporary means, namely technology. 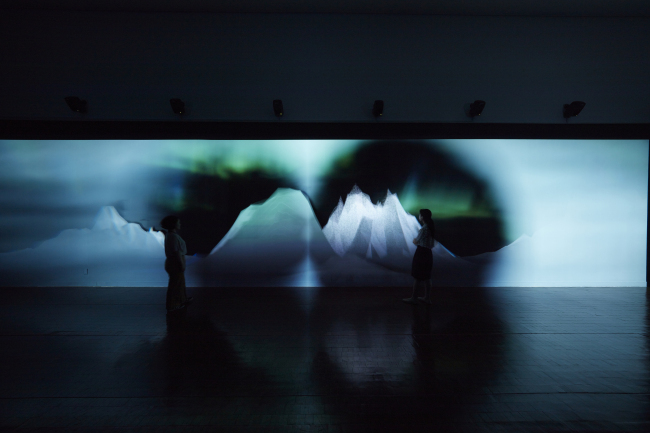 Kwon’s digital interactive installation provides video projections of different shapes of mountains and sounds that respond to viewer’s proximity to the screen. When a person walks along the 5-meter-wide and 15-meter-long exhibition space, the shapes of mountains soar, while speakers hung above make somewhat dissonant sounds. An unusual phantasmagoria comes from the walking experience. “When preparing the installation, I focused on the act of strolling. Strolling is a primitive yet also very poetic human action, and I wanted to bring that into my work,” said Kwon. “There are six different shapes of mountains and six different sounds that respond to the approaching viewers. But they immediately disappear when the viewers are gone, like dreams. You think you can reach the mountains but you never can. But it still provokes imagination, like other art productions,” Kwon added. 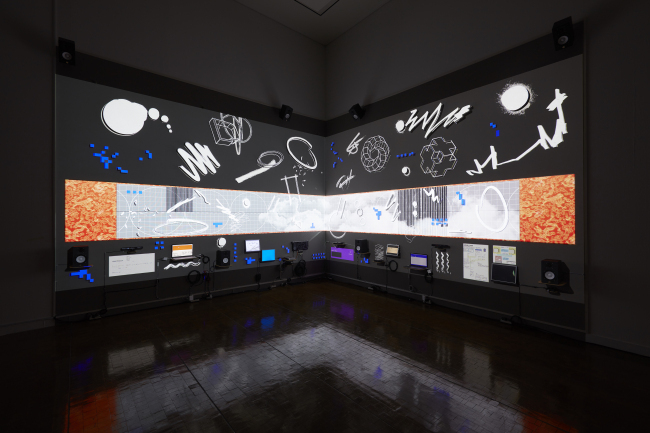 The rest of the nine commissioned works make very broad uses of technologies such as artificial intelligence, deep learning, robotics, visual sensors and voice recognition, to draw connections to past legacies. Comparing the landscapes of old paintings and how they are reinterpreted by young local artists, viewers are encouraged to ask what makes up past and future legacies.